According to Headland Machinery , the BMW Group in Great Britain employs close to 20,000 people. Bracknell in the county of Berkshire is home to their sales headquarters and the distribution center for spare parts which supplies 159 authorized dealers in the country. With its growing market share in Great Britain and the increasing complexity of its high-tech components, BMW recognized the need to invest in a modern computer-controlled system for storage and materials handling. Availability, pick speeds and efficiency in the distribution of spare parts had to be increased. BMW chose to initially install two Hanel Lean-Lift storage systems, complemented by a bespoke software system. Since this initial installation, two more phases have been implemented consisting of a further four and then six Lean-Lifts - making a total 12 Lean-Lifts. This package was able to achieve the pick speeds, efficiency and reliability hoped for by BMW. There can be no doubt that the Hanel Lean-Lift, with its superb engineering, controls, features and hardware, was the core element of the solution provided. Space saving was one of the first issues to be addressed. 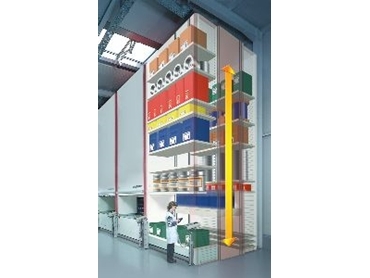 Due to the height optimization in the Lean-Lifts, near 100% utilization of storage capacity was achieved. Each cubic meter of space that BMW could utilize successfully was of the utmost importance. Moreover, the configuration of 12 Lean-Lifts working simultaneously allows an extremely high pick speed, enhanced by the latest bespoke software. A list of parts and components accumulates during the day from the orders submitted by the dealerships throughout the United Kingdom. These orders are then sent as a batch pick list to the 12 Lean-Lifts, which initiates simultaneous running of the machines. Machine users only have to wait a matter of seconds for stock to be picked for them. Furthermore, the pick-to-light system identifies the selected location, which significantly reduces or even eliminates picking errors. The products are accessed at a user-friendly and ergonomically correct height. The requested parts are brought to the user, in contrast to conventional systems where the user has to go to the product. This saves considerable amounts of user time and simultaneously reduces the health and safety risks. The Hanel Lean-Lift achieved every goal set by BMW for this project. Being a fast moving and highly successful company, BMW required a product and service that would be both dynamic and reliable. BMW Bracknell are very proud of the system that has been installed.